The most significant raw performance boost in Apple's updated MacBook Air lineup comes from new PCI Express flash memory, while Intel's latest Haswell processors are more focused on extending battery life than pushing horsepower. After getting his hands on Apple's new 2013 MacBook Air, Anand Lal Shimpi of AnandTech put the hardware through some initial tests to see how it performs. Equipped with a 1.3-gigahertz Core i5 Haswell processor, the 13-inch model is on par with the 1.8-gigahertz Core i5 Sandy Bridge processor found in last year's 13-inch model. But of course Intel's new processors are really about the battery life: Apple has promised that the updated MacBook Air models will offer all-day battery life. Specifically, the 13-inch model is said to boast an average of 12 hours of use, while the 11-inch model will provide 9 hours of uptime. 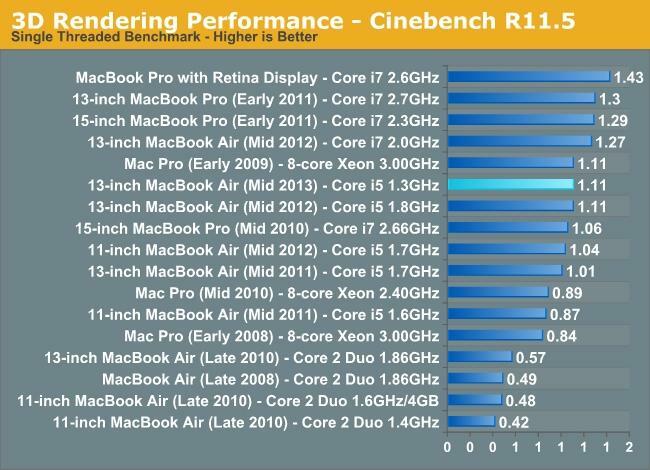 CPU performance test conducted by AnandTech. The most gains from Intel's Haswell come from battery life. Those improvements come in spite of the fact that the battery capacities on both the 11- and 13-inch models are unchanged from their predecessors, owing the power improvements to Intel's latest chips. Separate tests conducted by Primate Labs show the new 2013 MacBook Air offering performance improvements between 3 and 8 percent, while reducing power consumption by up to 25 percent. 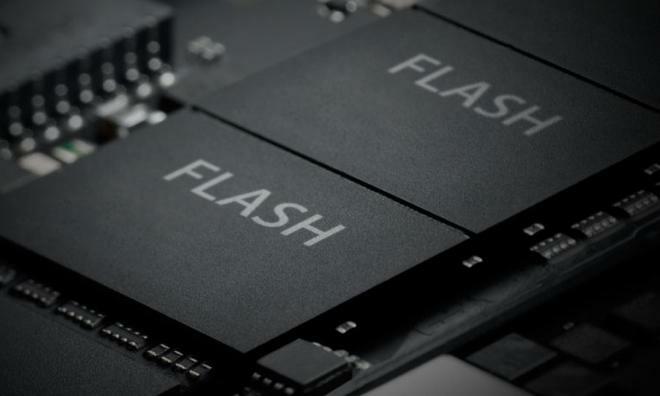 The real speed boosts in Apple's new MacBook Airs come from the inclusion of flash memory that now uses ultrafast PCI Express connectivity. Tests show that the new storage method offers peak sequential read/write performance of nearly 800MB/s. "This is a pretty big deal, as it is probably the first step towards PCIe storage in a mainstream consumer device that we've seen," Shimpi said. Previous generation MacBook Air models used the SATA interface, which maxes out at about 600MB/s. Apple also plans to use PCI Express connectivity for its forthcoming overhaul of the Mac Pro desktop. Not featured in the latest tests is the new 802.11ac Wi-Fi found in Apple's latest MacBook Air models. The high-speed wireless connectivity can be achieved when paired with Apple's new AirPort Extreme and Time Capsule models. Aside from the aforementioned performance and battery life improvements, the new MacBook Air models also come with more storage at a lower price than their predecessors. The 11-inch MacBook Air now comes with 128 gigabytes of flash storage at its $999 starting price, while the 13-inch model also includes 128 gigabytes for a $1,099 entry price.